Religion in Africa is not about doctrines, but about customs and beliefs. Human rights, like foreign religions, will thrive here only when they defer to traditional African ways. A contribution to the openGlobalRights debate, Religion and Human Rights. Many openGlobalRights authors have argued that religion and human rights activists can work together. I disagree. While this kind of strategy might work in Europe or the United States (US), it does not apply to Africa. Human rights are not the only foreign ideology that has had a hard time sinking deep roots in this continent; so too have foreign religions. In Africa, people are less interested in the specific doctrines of a given religion, than in the religion’s relationship with local customs and norms. Any religion that threatens African traditional beliefs encounters great resistance, and those that succeed defer to local beliefs. It is a fallacy to think that these same religions can somehow become vessels for carrying human rights to Africa’s people. Consider my own country of Uganda. 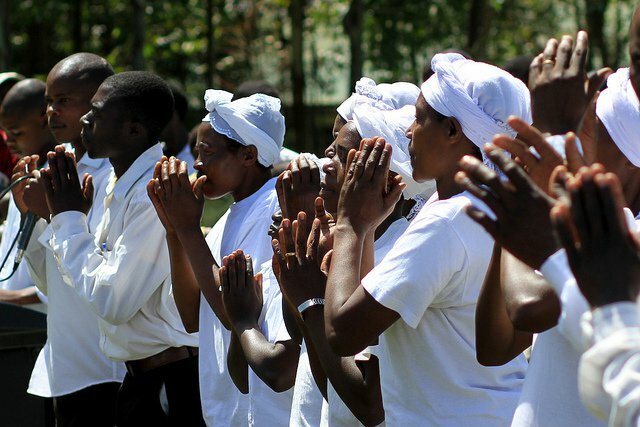 Here, Pentecostalism and its cry of ‘only one living God’ has had to fight hard to carve out a niche; many people view it as a campaign against traditional African values, rather than as a new and attractive religion. As a result, most of the Ugandans who join the Pentecostal churches do so in the hope of material gain. Pentecostalism, in other words, has a long way to go before it establishes roots deep enough to have a truly spiritual relationship with its followers. Pentecostalism, in other words, has a long way to go before it establishes roots deep enough to have a truly spiritual relationship with its followers. At the moment, most pastors rely heavily on appeals to poverty-stricken followers whose ideological affinity is weak and unreliable. To sink deep roots in Africa, Pentecostalism, like Islam, Catholicism and Anglicanism, will have to accommodate local traditions. Two such instances of Pentecostal churches prohibiting or denouncing local traditions – where other faiths have not – pertain to (African) surnames being associated to the devil and baptizing followers with new “holy” names, and burial rituals involving heirs of the deceased. The recent controversy surrounding anti-gay laws in Uganda highlights these issues. This controversy is an exception from other human rights matters, such as those that don’t directly interfere with belief systems, like freedom of speech, access to education, and the right to a fair trial, among others. Though homosexuality existed and was generally accepted in pre-colonial Uganda, certain tenets of the traditional belief system – such as family and communal structures and inheritance – caused mainstream Ugandans to undermine the rights of the LGBTQ community. Bishop Senyonjo, a gay rights advocate in Uganda, believes the oft linkage of procreation and homosexuality by citizens has led to the pervasive opinion that homosexuality is a western conspiracy to reduce the number of people in Africa. Pentecostal leaders led the movement to pass anti-homosexual laws in Uganda, since they believe homosexuality is incompatible with their image of Christianity. They portray themselves as leaders of a “sinless” and “pure” community, and view gay people as morally wrong. Religious leaders from the Catholic and Anglican communities, moreover, were nowhere to be seen. They realized that many in the world community were appalled by Uganda’s anti-homosexual laws, and that some of their followers in Uganda might be gay. At the same time, they dared not publicly contradict the beliefs of the majority of Ugandan congregants, lest they lose followers. So they did nothing. At the same time, other religious leaders and the media reinforced existing views and misconceptions regarding homosexuality. Evangelicals from the US have gone so far as as encourage Ugandan pastors to rally their audiences and interfaith congregations with homophobic rhetoric. This suspicion of homosexuality therefore makes any overt claim of rights very difficult. Such political realities, and the varying mechanisms of social repression, have historically deterred the gay community and its champions from engaging in political spaces or in the public arena. For human rights activists in Africa, the lesson is this: religious success is intricately connected to African culture. Yes, the state may come in for assistance especially through the courts of law, but again it is the people that at the end of the day implement laws. Therefore, anyone hoping to improve gay rights in Africa must craft an approach that is independent of specific religions and politicians and addresses the fears of moral transgression by tradition-bound Africans. To sink deep roots in Africa, Pentecostalism, like Islam, Catholicism and Anglicanism, will have to accommodate local traditions. Despite a longstanding reliance on a tradition-based culture, there is a new era of opportunity and optimism in political engagement and inclusion. When activists focus so intently on identity and rights-language framing, they neglect newly-rising opportunities to change the status quo through political systems. Any approach addressing gay rights must develop relations with both state and traditional leaders and institutions. Ideas, strategies, and claims that are applicable in the US or Europe therefore, will not be effective in Africa. Instead, human rights actors in Africa must first take the time to build relations with specific communities, and understand what their particular ethics and traditions are, and most importantly how and where various taboos stemmed from. Organized religion in Africa, including Pentecostalism or the Catholic Charismatic Renewal, will never be an ally for human rights. In an environment where all religions compete desperately for supporters among the same conservative majority, it is too risky to be seen as going against the flow.